This last would have been accompanied by a sharp prod between the shoulderblades to propel you forward. Can you remember this happening to you when you were a small child? You wriggled and squirmed and really didn’t want to have anything to do with this towering, bearded, overpowering aunt. But if you’d been left to your own devices, curiosity would eventually have got the better of you and you would have started to engage with this strange, mountainous, figure. So is it with many dogs. The Social Butterflies need to learn a little restraint and thoughtfulness, lest they leap up on the wrong dog and get bitten or terrorised. Or of course they may leap on a shy and worried dog who will think in terror that her last hour has come. The Wallflowers must be allowed to be Wallflowers! If you give them time to assess from a safe distance, they will gradually start to explore nearer, on their own terms. The funny thing is that we always seem to want the opposite of what we have! Those with the demented jumper-upper wish they had a calmer dog - continually snapping “Get down!” to their poor dog, who thinks that perhaps he needs to jump higher in order to please his owner. While those with a mouse-impersonator wish they had something more outgoing, and feel as if the world thinks they beat their dog. We always want to fit in with society’s view of being able to produce the perfect dog, without necessarily heeding what our dog has to say about it all. This commonly accepted thought completely ignores the fact that dogs are all different! They are individuals, just as we are. Their breeding will influence their behaviour, but there’s huge variation within breeds and types. And we’ve all learnt - through the notorious breed-specific legislation - that you cannot tar all dogs of one breed with the same brush. 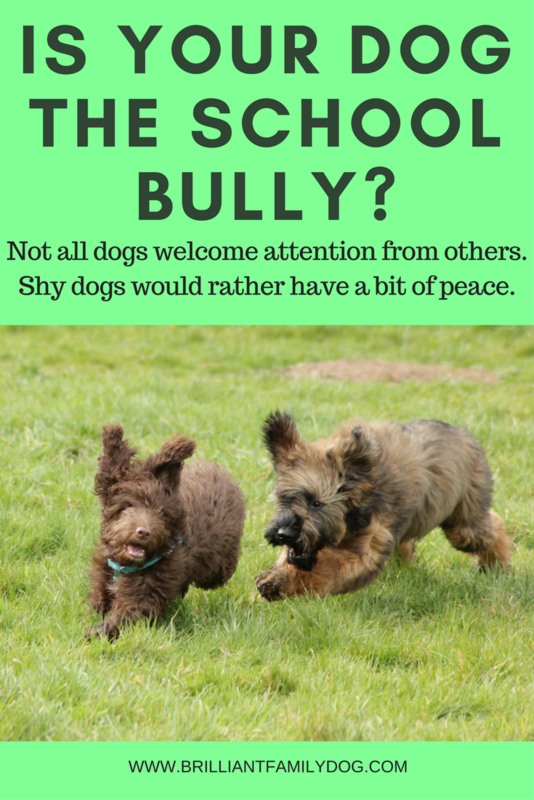 Because people notice the exuberant dog more than the shy one, they think that’s the norm. You can’t help but notice the bouncy Labrador with his tail thumping your legs (but there are many quiet, shy Labradors too). Or the half-crazed Poodle who thinks everyone must love him (Coco Poodle? Are you listening?). But In fact the quieter response is the more common one - and probably much better for survival in the wild situation that dogs were evolved in. Just because some dogs are in-your-face dogs doesn’t mean that this is how all dogs should be. And what about responsibility for other people’s dogs? Let’s say you have one of the bouncy dogs who thinks the world is his oyster and wants to greet everyone. Now imagine that instead you have one of the shy, retiring dogs. Maybe your dog desires only to be left alone, to have peace and quiet to enjoy her walk without interference. Your shy dog could be enjoying a tremendous game with you and your frisbee or ball, and the last thing she wants is someone muscling in on her prize. How would it be if you were enjoying a makeshift game of badminton with your family in your local park, and a load of louts came barging in, snatching the shuttlecock, knocking your children over and treading on them, wrecking your game - with their parents laughing at their antics all the while. Nice? I don’t think so. So if your dog is the super-friendly one, don’t let him rampage all over the place, upsetting calmer, quieter, perhaps older, dogs. It can take a shy dog several days to recover from an experience like this - really! They may have to stay indoors for days to allow their hormones to settle back down - just as you might if you were in a mild car shunt. It could be a few days before you were happy to get behind the wheel again. This dog’s owner may be upset and begging you to put your unruly dog on a lead. This request, sadly, is often greeted with derision and insults. Many owners of boisterous dogs assume that their dog’s behaviour is not only natural, but acceptable. I’m here to tell you it’s not! These owners seem to think they have more right to be out walking their dog than others with more challenging dogs. They form this opinion, I believe, because sometimes their unruly dog is greeted by a show of teeth and snarling from the other dog. They assume that this dog must be nasty - aggressive - and therefore to blame for whatever happens. They forget that that dog was quietly minding her own business until their dog landed on top of her! Sadly, this usually gives rise to more insults and abuse. It doesn’t take much imagination to transfer this scene to a school playground. Some children will be playing happily together while others cruise the playground looking for entertainment - often found by annoying the quieter children. Of course, playgrounds are carefully “policed” by school staff, and unacceptable behaviour should be halted immediately, so that the boisterous children can learn some social skills, learn how to treat other people respectfully, and the quieter children can enjoy their quieter life. Is this chase enjoyable for both dogs? We don’t have school staff in the park. We’re meant to be grown up enough to manage this ourselves. I know it comes as a surprise to many of the “My dog is friendly” persuasion to learn that many other dogs are not. They are instead nervous, anxious, possibly recovering from an unsolicited attack which - unsurprisingly - has made them suspicious of all dogs. Or they may simply by diffident and self-contained, and not disposed to talk to strangers. And some of these bouncy-dog owners will be genuinely astonished to learn this! But once you have learnt it, let it inform your dealings with other dog-owners and their dogs. It’s not a dog’s fault if he was attacked. It probably wasn’t his owner’s fault either, but it can have a lasting effect on the victim. It’s equally not a dog’s fault if he was not properly socialised as a puppy, and if he was adopted after puppyhood it’s not his owner’s fault either. Most people are decent and honest (in my experience), and they really wouldn’t want to see a child hurt or humiliated by another child’s actions. All they need to do is realise that dogs are as different in temperament as children are, and that some sensitive ones can be seriously upset by another dog-owner’s thoughtlessness. The quiet, shy dog doesn’t care whether the boisterous dog has good intentions or not. It doesn’t matter if “He just wants to play,” or whether he is intent on tearing the other dog’s throat out. The effect of the confrontation can be the same - causing the anxious dog to get more withdrawn, or - as can often happen - become proactive at keeping other dogs away by putting on a tremendous display of aggression. How can I help my dog? So watch your puppy or new dog carefully. Whether extrovert or introvert, be sure to protect them from bad experiences. Allow your boisterous pup to express himself in a way which suits him, while gently teaching him what we would prefer. And let your quiet observer quietly observe. From behind your legs if that’s where she feels comfortable. When she’s ready, she’ll be able to take much more in her stride.